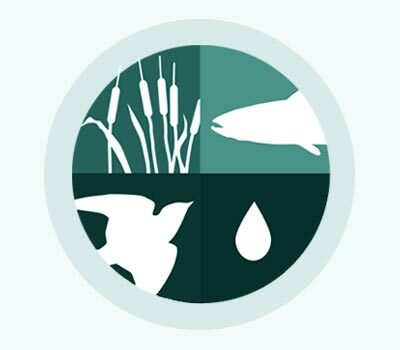 The Ecological Flows Tool (EFT) is a decision support tool emphasizing clear communication of trade-offs for key ecosystem targets associated with alternative conveyance, water operations and climate futures in the Sacramento River and San Francisco Delta eco-regions. Practical integration of multi-species, multi-habitat needs in the evaluation of water operation scenarios is challenging. 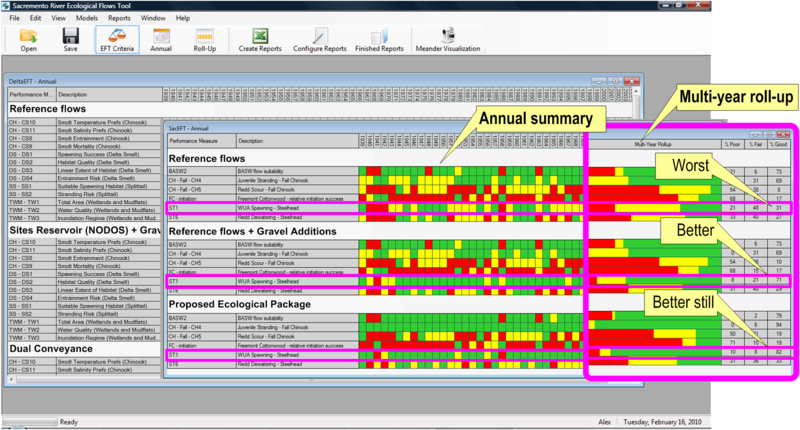 EFT facilitates the inclusion of a broad suite of ecological considerations into water use planning exercises. We take a bottom-up, process-based view of how flow and related aquatic habitat variables (e.g., salinity, temperature, turbidity) are tied to a variety of ecosystem functions for representative sets of focal species and habitats (Chinook salmon, steelhead, green sturgeon, Delta smelt, splittail, tidal wetlands, invasive species deterrence, bank swallows, channel erosion/migration, Fremont cottonwoods, large woody debris recruitment). By leveraging many of the same planning models used in existing socioeconomic evaluations in California (e.g., Calsim, DSM2), EFT provides an “eco plug-in” to the water studies based on use of these models. Our vision is to link physical models to a representative sampling of individual ecosystem components inside an overall compressed, cross-disciplinary synthesis tool for evaluating conveyance operation alternatives both in the Delta and Sacramento River eco-regions. When expanding the number of ecological targets considered in water use planning, practical synthesis becomes a challenge to disseminate, especially to an audience with various levels of understanding. EFT outputs are accessible through the EFT Reader software tool which emphasizes simplicity, such as traffic light roll-ups that quickly reveal the rank order ecological performance of alternatives, as well as more detailed results on target and avoidance flows by location and time-period. The EFT Reader supports ecological trade-off evaluation in the Sacramento River eco-region (SacEFT), with inputs derived from the Sacramento River Ecological Flows Study (a synthesis of two decades of restoration work by The Nature Conservancy and partners) and subsequent peer reviews. EFT Reader also supports evaluations of the Bay Delta Conservation Plan’s proposed conveyance and habitat restoration measures. Delta focal species and habitats include Chinook, steelhead, Delta smelt, splittail, tidal wetlands and invasive species deterrence. The Delta Ecological Flows Tool (DeltaEFT) branch of the EFT software explicitly links upstream Sacramento River eco-region responses (via SacEFT investigations) to ecosystem responses in the Delta. One of the biggest challenges in the practical implementation of ecological flow guidelines is the wide range of objectives, focal species and habitat types that need to be considered. EFT has brought into focus how these various objectives cannot all be simultaneously met. In nature, conditions often benefit one target or species to the potential detriment of another in any given year. Fortunately, flow characteristics that benefit the various ecological targets investigated are usually required on a periodic basis and not every single year. EFT studies simplify communication of these trade-offs, and catalyze definition of state-dependent management practices that promote the development of needed flexibility in the water management system. Funding for EFT was provided by the CALFED Bay-Delta Ecosystem Restoration Program. Please contact us with any additional questions regarding the EFT Reader.